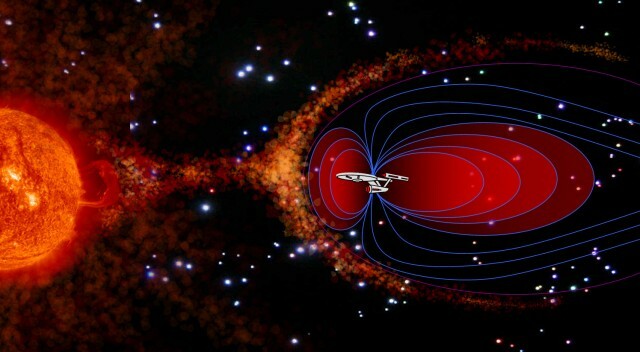 Scientists at the Rutherford Appleton Laboratory in the UK are working on a Star Trek-like deflector shield to enable the transport of humans between planets and stars without subjecting them to lethal doses of cosmic radiation. This research comes at a vital time, as numerous groups, including NASA, look to send humans to Mars — but without adequate shielding from the Sun’s harsh cosmic rays, it could be a one-way trip full of vomiting, diarrhea, and more serious symptoms of radiation poisoning, such as death. Other than time and money, one of the biggest barriers to sending humans to other planets is Solar radiation (from flares and coronal ejections) and galactic cosmic rays. The exact origin of GCRs is unknown, but it’s theorized that they originate in supernovae and the dense nuclei of other galaxies. In any case, both forms of radiation consist of high-energy protons that bombard every square inch of the Solar System, including Earth. Being hit by a high-energy proton is bad news, and if you get hit by enough you will develop radiation sickness, your tissues will degenerate, and you might develop cancer. Fortunately, here on Earth you’re protected from Solar radiation and GCRs by a number of awesome effects. The Earth’s atmosphere absorbs most Solar radiation. The Earth’s magnetic field deflects all but the most powerful GCRs. There’s also an interplanetary magnetic field, produced by the Sun, which deflects GCRs at the edge of the Solar System (the heliopause; the region of space that Voyager-1 recently traversed). As a result, we receive very little radiation from space here on Earth — about 0.4 milli-Sieverts (mSv) per year. Astronauts aboard the Apollo missions, though, which traveled far away from Earth’s atmosphere and magnetic field, received on the order of 1.2 mSv per day, or 1100 times more radiation than those of us down on Earth. 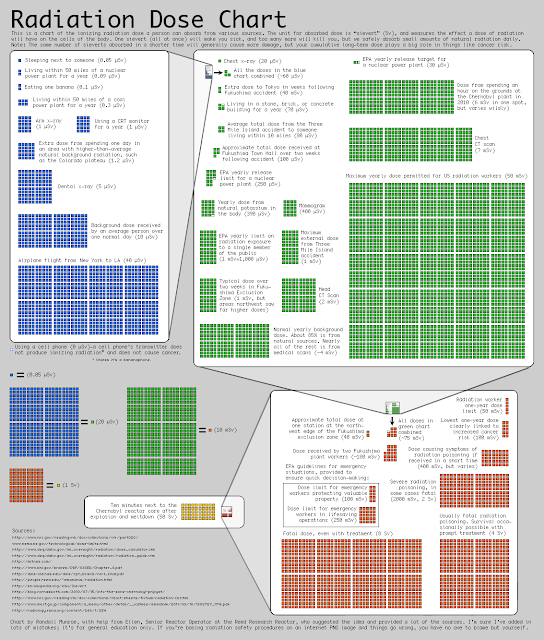 XKCD’s radiation dose chart. Click to zoom in. As we know from XKCD’s amazing Radiation Dose Chart (pictured above), we know that a dosage of around 100 mSv in a single year increases your chance of developing cancer. It’s estimated that a trip to Mars could expose the astronauts to as much as 1,000 mSv (1Sv) or more. Solar radiation and GCRs are unlikely to cause acute radiation poisoning — you need a bigger dose in a shorter period — but unless you want everyone to develop cancer, or spend the entire trip vomiting and ejecting liquid poop, spacecraft will need adequate radiation shielding. Which leads us neatly onto the Rutherford Appleton Laboratory in the UK, which has devised a “mini magnetosphere” that essentially recreates the protection provided by the Earth’s magnetic field. 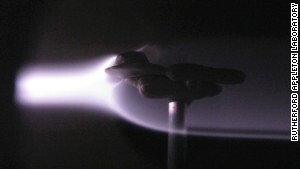 The scientists have so far used the magnetosphere to protect a scale spacecraft from radiation (pictured right, in a plasma stream), and they’re now working on a concept spacecraft, called Discovery, with a full-scale magnetosphere that could theoretically take humans to Mars. The advantage of the magnetosphere method is that it’s significantly lighter than conventional radiation shielding, which usually consists of thick metal plates. Other viable methods have popped up in recent months, though. Most notably, Inspiration Mars, which will send two humans to Mars in 2018, will employ a radiation shield fashioned out of food, water, and poop stored against the hull of the spacecraft.